It’s beautiful white bark and grand seasonal leaves (particularly its golden autumn foliage) characterize the beautiful aspen tree perfectly. As the most widely distributed tree in North America (and one of the most in the entire world), the aspen has overt implications and symbolism for human life. For one, they were commonly used as a utility by primitive groups. As time progressed, people began to view them more for their spiritual value as opposed to physical utility. Many groups throughout history have viewed aspens as beholders of root magic that allow anyone to enter into the realm of the mystic. Thus, it is the perfect transformative tool for both wise and experienced spiritual intellectuals and newcomers to the practice, as this tree enables states of differing levels of spiritual awareness at all times. The mighty aspen tree symbolism provokes a sense of adventure and encourages us to recognize our own wings. Once we’ve done this, we are equipped to fly. We just need to muster the courage to spread those wings, expand on our ideas, and have a desire to express ourselves more openly, honestly, and fully. On an even deeper note, some say that the aspen tree is a guiding force for helping us to understand that love is the ultimate power, standing behind and overcoming all other things. The aspen tree symbol teaches us to be confident in this and other things that we learn. It claims that this confidence and competence will allow us to live beyond physical pain, suffering, and worry. Rather, we can focus on all of the joys in life, no matter how big or small. 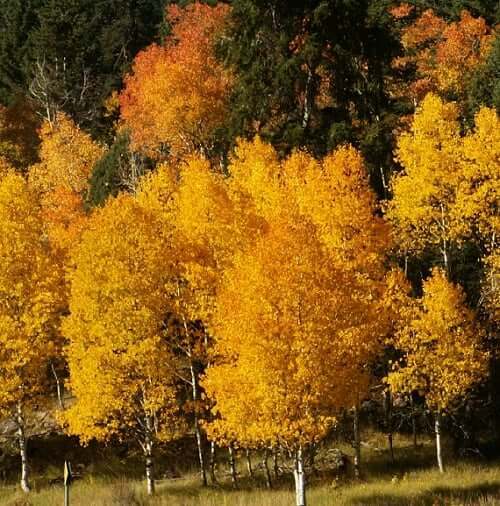 Folklore and fables have included the dancing aspen and its quivering multicolored leaves throughout history. One way to truly connect with the wonder of the aspen tree is to observe it in action. Allow yourself to enter into a relaxed and receptive meditative state. Loosen all of your muscles, freeing your body of all stress and tension. Watch as the bright white skins of the tree glisten in the light and quiver in the wind. As you gaze at the leaves, regardless of the season, you will be mesmerized by their vibrant color and wistful movement. This is the magic that the ancient Celtic Druids spoke of. While recruiting and training their novices, Druids journeyed to aspen groves with them, inducing trances and inciting them to become observant of their surroundings and how they are applicable to each person’s individual quest. Additionally, Druids and their followers used the sensory experiences with aspens to foresee future qualms, opportunities, strategic advantages and successes. The experiences that they had there served to re-affirm the concept that they preached: that of the importance and realness of connectivity to nature. As with many other trees, the ancient Celts in particular believed that the aspen tree symbolism had many lessons to teach. They took inspiration from this tree and used it transform themselves for the better. To them, aspen trees were symbolic of the importance of focusing on one’s goals, duties, and aspirations in life. By mimicking the spiritual nature of these trees, Celts felt that they were able to channel greater awareness of their surroundings and develop a more sound relationship with nature. They strove to live in purity (Celtic purity symbols), like the aspen, taking opportunities when presented and persevering through transitional periods with grace. Rather than being afraid or intimidated by change, these people approached impending transformation with knowledge, acceptance, and an attitude of openness. They enabled themselves to develop this receptive nature by observing the transformative and cyclical nature of aspen trees. All of life and nature are essentially on the same course, so if plants, trees, and animals go through metamorphic periods, it is surely alright (even natural and ideal) for humans to do the same.